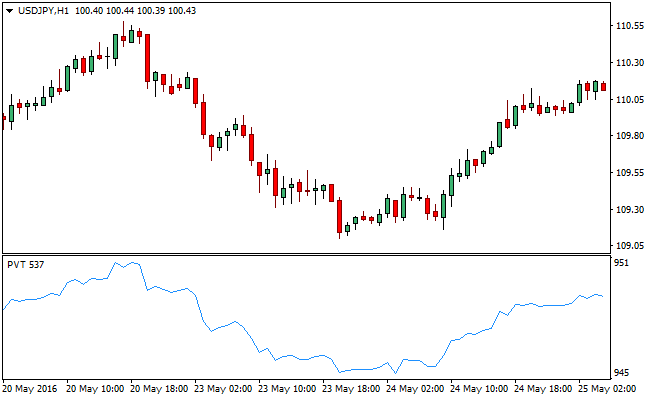 The Price and Volume Trend (PVT) forex indicator for MetaTrader 4 is deployed in gauging the price to volume correlation. The workings of the PVT indicator is similar to those of the Balance Volume indicator and shows the growing summation of the trade volume relative to the altering prices. The Price and Volume adds and minuses just a percentage of the volume in view of surging and declining volume as well as altering price. Price dynamics is represented more closely on the Price and Volume Trend (PVT) Indicator. The PVT indicator comes with just one “Input Variable” in its parameter setting, where traders can actually select what price point to put on the indicator. One of the most used price for computing the PVT is the closing price, but this can be altered as the PVT can be applied to opening and High/Low prices. The Price and Volume Trend (PVT) Indicator can function in both trending and ranging markets with divergences being the most used method. The old-fashioned techniques of oversold and overbought regions are not quite consistent owing to the fact that the PVT indicator does not have fixed values. It is possible for the PVT indicator to continue to rise without showing signs of a decline during ranging markets and this can also happen during sessions when the PVT is in decline as well. This is the more reason why the divergence of the PVT indicator is a more consistent style of trading when the market is trending. Customization options: Variable (ExtPVTAppliedPrice), Colors, width & Style.